Note – A Bug’s Life and Toy Story 2 opened in limited release, so their second weekend drops were not included. Next weekend will be interesting, because on Wednesday The Twilight Saga: Eclipse opens, and that is expected to be one of the top blockbusters of the year, and should dominate all in its path, and then the weekend after that Despicable Me opens. So it’s definitely a rough couple of weeks ahead in terms of competition for Toy Story 3. 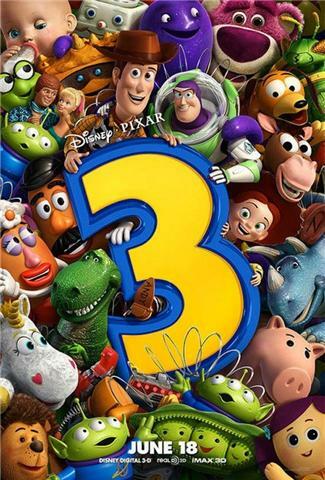 I wouldn’t underestimate Toy Story 3 has people are quite loyal to the Pixar brand. After two weekends, Toy Story 3 has taken in $226.5 million. Debuting in 2nd place is Grown Ups with a gross of $41 million (I predicted a 2nd place finish and a gross of $36 million). The per theatre average for Grown Ups was $11,602. The film is a return to form for Adam Sandler as Grown Ups gave Sandler his highest opening weekend since 2006’s Click. Here’s the list I used on Friday to make my predictions; just to show how this has been Sandler’s best opening weekend in five years. Sandler looks to have another $100 million hit, and I would expect it to do all right in the coming weeks. It will drop a bit next weekend because of The Twilight Saga: Eclipse and The Last Airbender opening, but it is the only major comedy in release in this weekend’s top five, so it should do all right. Debuting in 3rd place is Knight and Day with a gross of $20.5 million (I predicted a 3rd place finish and a gross of $26 million). The per theatre average for Knight and Day was $6,617. The opening has to be a disappointment, as the opening weekend gross was lower than 2008’s Valkyrie which brought in $21 million on its opening weekend. The focus of the disappointment has to be on Tom Cruise, as he was the main star of the film, and despite mixed to decent reviews, everyone should be able to agree that Knight and Day underperformed. Cruise should be able to guarantee a $25-$30 million opening, and the premise of film was decent, as it looked like it could be a lot of fun. The marketing blitz was in full effect, and Cruise had some good buzz going for him after the MTV Movie Awards. None of the hype translated to its first weekend, and Knight and Day is just another film that has disappointed in the summer of 2010. Since its Wednesday opening, Knight and Day has taken in $27.7 million. The Karate Kid dropped from 2nd place to 4th place with a gross of $15.4 million (I predicted a 4th place finish and a gross of $17.9 million). The Karate Kid had a per theatre average of $4,118 and was down only 48.5% from last weekend, which for the second weekend in a row means The Karate Kid had a drop of less than 50%. The Karate Kid has now become the highest grossing film in the franchise, surpassing The Karate Kid II’s gross of $115.1 million, although if you were to adjust the films for inflation, The Karate Kid II is way ahead. After three weekends, The Karate Kid has grossed $135.6 million. Dropping from 3rd place to 5th place is The A-Team with a gross of $6 million (I predicted a 5th place finish with a gross of $7.9 million). The A-Team had a per theatre average of $1,851, and was down 58.3% from last weekend. The A-Team really took a big hit this weekend as the combination of Knight and Day and Grown Ups took away its audience. The per theatre average is also troublesome, and The A-Team looks like it will be on DVD shelves sooner than most people expected. After three weekends, The A-Team has grossed $62.8 million. Forgetting Sarah Marshall finished its run with $62.8 million, and after four weekends Get Him to the Greek has taken in $54.4 million, so it’s going to be a close finish to see if Get Him to the Greek will have a higher gross than Forgetting Sarah Marshall. With The Twilight Saga: Eclipse and The Last Airbender opening this coming weekend, I expect Shrek Forever After’s run to come to an end very soon. As mentioned above, after six weekends, Shrek Forever After has grossed $229.3 million. Prince of Persia: the Sands of Time finished in 8th place with a gross of $2.8 million (I predicted a 7th place finish and a gross of $3.4 million). Prince of Persia: the Sands of Time had a per theatre average of $1,513 and was down 49.7% from last weekend. After five weekends, Prince of Persia: the Sands of Time has taken in $86.1 million. Dropping from 7th place to 9th place is Killers with a gross of $2 million (I predicted a gross of $2.7 million and an 8th place finish). Killers had a per theatre average of $881 and was down 60.3% from last weekend. After four weekends, Killers has grossed $44 million. Dropping from 8th place to 10th place is Jonah Hex with a gross of $1.6 million (I predicted a 10th place finish and a gross of $1.9 million). For the second weekend in a row, Jonah Hex had an absolutely horrendous per theatre average of $566 from 2,825 theatres. I consider Jonah Hex to be a bigger bomb than MacGruber as MacGruber had a budget of $10 million, and failed to even reach that number. Jonah Hex has a budget of $80 million, and should finish its run with a gross just over $10 million. After two weekends, Jonah Hex has grossed $9.1 million. In its 8th weekend, Iron Man 2 fell out of the top ten, as it finished in 11th place with a gross of $1.3 million. After eight weekends Iron Man 2 has grossed $306.7 million (The original Iron Man finished its run with $318.4 million). Wild Grass – The comedy about the French New Wave and a lost wallet grossed $35,700 from 5 theatres giving it a per theatre average of $7,140. Restrepo – This film that takes a look at some U.S. soldiers fighting in Afghanistan grossed $30,500 from 2 theatres giving it a per theatre average of $15,250. South of the Border – The Oliver Stone film that takes a look at the different movements (political and social) going on in South America grossed $21,000 from one theatre. This film had the highest per theatre average of the weekend. Dogtooth has not reported its opening weekend grosses as of this writing. My predictions compared to the actual top five films were off by $27.1 million. Next weekend, vampires and werewolves do battle in The Twilight Saga: Eclipse and for younger kids the action-adventure The Last Airbender opens. Check out Biff Bam Pop next Friday to read my predictions!